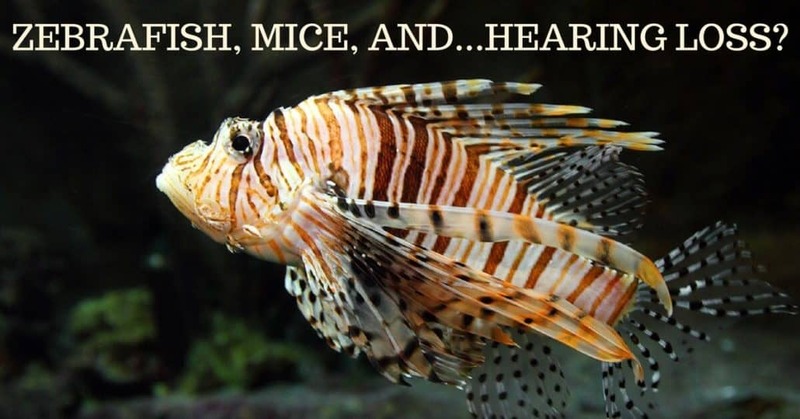 Zebrafish, Mice, and… Hearing Loss? Research into the genetics of hearing loss have been making leaps and bounds in recent times, with a new study delving into the evolution of the human ear as a way of understanding hearing loss. Researchers at the University of Southern California Keck School of Medicine have been looking at the jaw structure of zebrafish as a way to interpret genetic abnormalities in the ears of mammals. Why are researchers studying the jawbones of fish? The answer lies in the long evolution of mammals. Our middle ear is home to three tiny, sensitive bones: the malleus, the incus and the stapes. Together the three middle ear bones are referred to as the ossicles. The malleus and incus, commonly called the hammer and the anvil, respectively, evolved out of the jaw structures of ancestral fish. Where fish and reptiles developed other structures to sense sound and vibration, the hammer and anvil bones of their jaw mechanics gradually became adapted to an efficient way to detect and process sound in mammalian ears. This evolutionary link is the remarkable basis for USC’s new research findings. Doctors began their inquiry by asking questions about the role of conductive hearing loss has in the hearing problems of patients with Alagille Syndrome (abbreviated as AGS). Alagille Syndrome is most often classified as a disorder that affects the liver but is a genetic disease that demonstrates symptoms in a wide range of bodily symptoms including problems within the skeletal system, the heart, the eyes and the kidneys. AGS is also marked by a much higher than average incidence of hearing impairment, with roughly half of people with Alagille Syndrome developing hearing loss. Conductive hearing loss is hearing loss caused by problems within the middle ear bone structure. By contrast, sensorineural hearing loss is hearing impairment caused by issues within the inner ear and auditory nerve. The USC research team chose to focus on two genes that are most often mutated in patients with AGS, NOTCH2 and JAG1. Looking at similar genetic mutations occurring in zebrafish, clear malformations in the jaw structure was present. This indicated that the two mutated genes may also be causing malformations in the human ossicles, encouraging conductive hearing impairment. To experiment with this premise, the USC team began introducing the genetic mutation into mice. Just as the mutations to the two genes showed in physical abnormalities in zebrafish jawbone structure, the corresponding bones, the ossicles of the mice, developed malformations. Researchers observed deformity in the stapes and the incus bones of mice. The mice carrying the mutation also demonstrated conductive hearing impairment. From their correlation of genetic effects within zebrafish and mice, the USC researchers next studied populations with Alagille Syndrome to see if similar defective ossicles were present, and, if so, whether they were causing conductive hearing loss. The study analyzed hearing data for 44 study participants with AGS and found a high rate of conductive hearing loss. About one-third of the patients they looked at with Alagille had conductive hearing problems. The team also performed CT scans on a small sampling of study participants which gave them a deeper understanding of the effects of gene mutation on the human ossicles. Within a group of five subjects, a variety of ossicle malformations were present, demonstrating that a range of middle ear abnormalities could lead to hearing loss. This research, from fish to rodent to human tracks the impact of genetic issues across species. The research done at USC expands the current understanding of Alagille Syndrome. In treating the condition, it contributes to doctors offering their patients more comprehensive care. Raising awareness about the occurrence of conductive hearing issues in people with AGS helps them access better solutions earlier, improving their quality of life. If you’ve noticed changes in your hearing, make an appointment with Bay Area Hearing Services your first priority. Our team of hearing specialists puts your hearing wellness first and foremost. We use state-of-the-art equipment to examine your hearing and to get to the bottom of any hearing issues you may have. Additionally, we offer a full selection of quality hearing solutions, alongside professional fitting and programming to insure you are hearing your best. Contact us today to set up an appointment and be on the path to better hearing.